Order this gorgeous maple leaf fall wreath & welcome autumn. 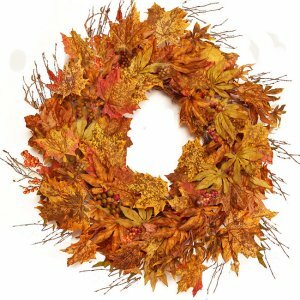 Designers have decorated this large wreath with silk like fall maple leaves and accented it with fall berry clusters. The wreath is created with wispy natural vines. Fall Maple Leaf Wreath measures 26" for a grand display of color.